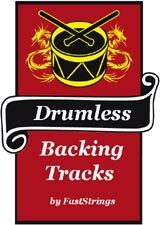 Drumless Backing Tracks mp3 free download. It’s a dream for all drummers. Here is for your attention drumless backing tracks, jam tracks, or drum minus mp3 tracks, drumless play alongs or whatever you want to call them. The largest collection of tracks for drummers. This set includes almost every style: Rock, Jazz, Latin, Blues, Metal, Funk and so on… You fill it, the drums are completely absent. All drumless songs in high quality and available for download. Those tracks were collected specially for FastStrings fans. No matter which style you play or what skills you got. If you’re playing guitar, so check backing tracks for guitar. Backing Tracks for Drummers to Practice and Perform. Play along, jam tracks, minus drums for free. Hush Puppies – You’re Gonna Say Yeah! Street Sweeper Social Club – Fight! Smash! Win! The Fall of Troy – Panic Attack! Tokio Hotel – Ready, Set, Go! How do I listen and download what I want? How can I download drumless of Benny Goodman – Sing Sing Sing? Wait so how exactly do i download them now? Hi is there bold as love by john mayer? I need to download this. thanks you very much,you are the best! Thank you! This is awesomely incredible! Thank you so much. My dad is drummer and he will like this a lot. Some Fantastic Material here. It covers all bases for drummers. Nice..been lookin for something like this. Trop bien c’est une des meilleures collection de drumless track. These drum tracks are the best and I want peace for the world. Every body should learn these tracks. What a deal. Thanks for the music. WOW! Thank you so much for this! This will definitely be helpful in my practice sessions! thanks man!!! drummers apreciate this, for shure!!!!!!! This is what I was looking for…thanks!!! Thank you, I’ve just been looking for information approximately this topic for ages and yours is the greatest I have came upon so far. not sure if I did this right but would like to download black Sabbath and led zeppelin songs thankyou in advance if tis works I will certainly recommend you to my friends thanks again! Sou do Brazil… i’m brazilian. Pode me mandar por e-mail algumas musicas para tocar com a minha bateria? Thanks a lot for this wonderful site ! the best… even still in the end of 2013… you are the best! Wow, I was hunting for a drumless version of Stranglehold by Ted Nugent, found it, and wound up here, what an awesome site. Thanks you guys…awesome!! exelent! awesome this page friends! GREAT!!! The best page for drummers!!! thanx a lot!!! me gustaria obtener los tracks para practicar las canciones en mi set de bateria. This is awesome! Thanks! Nice drumless tracks. I been searching all night for the perfect approach to jam to and this is it. Do you need a premium account to download this? And is it with vocals? or without? EXCELENT PAGE….Y LOVE DRUM ME. thanks dude ! thanks very much. How to donate? I want to contribute. Life is too short to play all of these songs. Somebody pinch me…! I’ve never seen before so many tracks without drums. Thanks!! that’s what i need! Thanks can’t wait to jam to these tracks!! thanks! Too good! I’ve finally found some! This sounds promisig!!!! But I am not sure how to access to teh downlod… Do I miss something? Are these tracks the original songs but without drums? is there vocal? Oh. This is the espetacular drumless material that I’ve found. I need to ask a question to the people who downloaded the 1100 drumless tracks. I downloaded the ten seperate parts but they are all the same. did anyone else have the same results or did I miss something? WOW!! just plain WOW!! THANKS!! Thanks alot.. been searching for some good stuff for awhile.. Thanks a lot! That is an awesome collection. awesome list and great site. many thanks!!! Track songs are good, the only track I was disappointed with was alanis morrisette thank U track, it’s not by the original artist. Plus it’s only about 60 seconds then changes to a different artist. Please can you put original artist drum less track of alanis morrisette “thank U” track!! nice to see so many drummer friends’ happy comments, thanks ADMIN! By the way, can you also please try adding some BUDDY RICH tunes’ playalongs? Incredible compilation. Any drummer’s dream. Thanks from Spain. I just found this website. Simply AMAZING!!! You are the best, man! I can’t even imagine how much this website has helped and will continue to help people like me. awesome! fantastic! thank you guys! Thank you for sharing this treasure !!!!! The best website of instructional dvd and tons of more. You rock !! Took a few weekends. But well worth it. Major big .rar files. Mucho Thanks Muchaos at FastStrings! Wow, this is AWESOME! My teacher will go berserk! GREAT!!!!!!! !The best page for drummers!!! !